So I set out to try for myself, and here's the deal. This is a 500 calorie monster (1/4 to 1/6 of your average daily intake), and in my opinion has a few flaws. First, it's a bun. I was hoping it would be more doughnut-like in texture (more sugar for Dustin...) but it was just too bun-ny. The almond goo and the whipped cream both receive a positive grade, though the whipped cream was a little thick for my liking. Finally the icing sugar was great on the top. Honestly, it's icing sugar, of course it's great. Now my current Semla count is just at one, and some of these traits (excessive bun-iness, thick whipped cream) may be relative to the cafe I first visited. I vow to try out at least a couple more before they disappear from the bakeries for another year. I'll leave you with some fun facts I came across. Each Swede eats an average of 5 Semlor per year, running about 20-30kr each (about $3.00-$4.75) at a bakery. That's some big business with 9 million people in the country. The other Nordic & Baltic countries share a taste for this pastry as well, often throwing their own take on it (melted chocolate on top, jam on the inside). It didn't take long for my 2nd Semla experience. 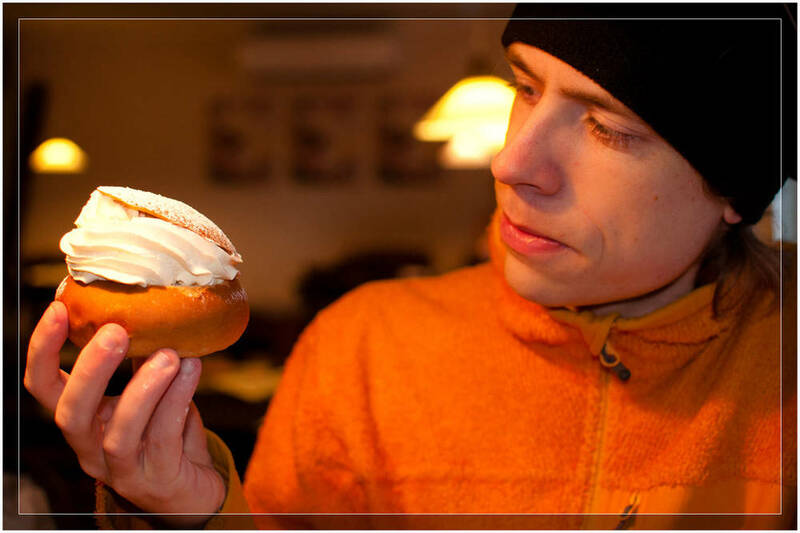 This time at Trollhattan's 2011 Årets Godaste Semla (Tasty Roll) award winner, Café Gillet. It was purely by chance and I can happily say that it was many times better than my first Semla. Not only did it not feel all heavy or taste too bun-ny, but the whipped cream and ample almond goo was just great. As a service to all of my readers, I vow to taste another, and another (...) and report back. You're welcome. ** reminds me of a certain friend who challenged some of us to a 'one-pound challenge' by eating a one pound hamburger. We refused, and after eating it, he claimed victory. A few weeks later, he came down the a case of the gout. It was at this time when we all agreed... the burger won. This post was featured by Suzy Guese in her Suzy Stumbles Over Travel feature.